Assistant Delaware City Manager Jackie Walker describes the proposed resolution to the Delaware County Agricultural Society Board of Directors during Tuesday’s meeting. Tuesday’s much-anticipated Delaware County Agricultural Society Board of Directors meeting came and went without a vote on Delaware City Council’s gun resolution that was sent to them last week. The resolution, which called on the agricultural board to require background checks for any private gun sale at the fairgrounds, was sent to the executive committee for further research and discussion. Residents siding on both sides of the issue showed up to address the board and make their recommendations. One of them was Delaware Hayes senior Mallorie Watts, who implored the board to move their consideration beyond guns as they relate to mass shootings. Delaware Police Chief Bruce Pijanowski, when questioned last week about the inability of those without a Federal Firearm Licence (FFL) to conduct a viable background check, provided more clarity on what council’s resolution is asking for. “(The resolution) would essentially ask the fair board to say no private sales at organized events,” he said. Pijanowski was expected to address the board but was not present. Resident Mike Newbern, reading from provision 9.68 of the Ohio Revised Code, urged the board to consider the challenges and legal implications that would come with an approval of a resolution that violates that code. Don Howard, president of the Delaware County Agricultural Society, was pleased with the conversation residents brought to the table, and also the respect they showed for one another. The board meets on the third Tuesday of the month, making May 15 the date to circle on calendars. However, Howard couldn’t commit to the resolution being voted on then, saying it would depend entirely on the status of the research the executive committee will be conducting. 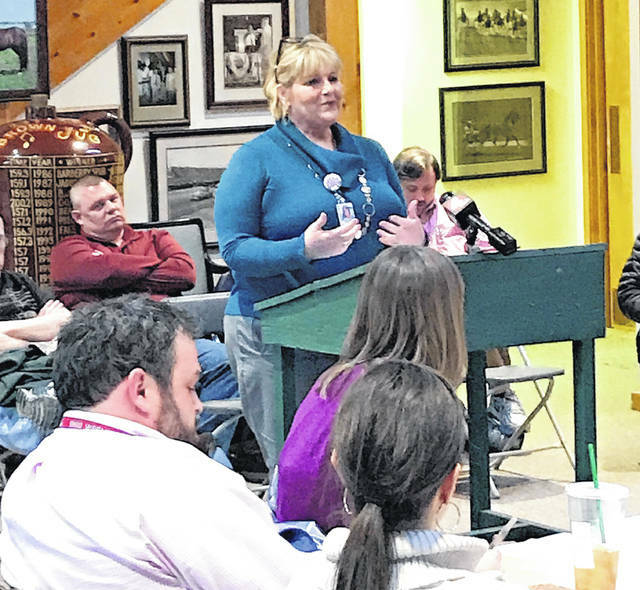 https://www.delgazette.com/wp-content/uploads/sites/40/2018/04/web1_Walker.jpgAssistant Delaware City Manager Jackie Walker describes the proposed resolution to the Delaware County Agricultural Society Board of Directors during Tuesday’s meeting.